The large, circular feature in this image is an old meteor impact crater. 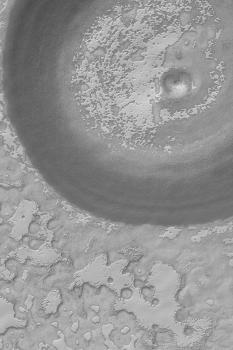 The crater is larger than the 3 kilometers-wide (1.9 miles-wide) Mars Global Surveyor (MGS) Mars Orbiter Camera (MOC) image, thus only part of the crater is seen. The bright mesas full of pits and holes--in some areas resembling swiss cheese--are composed of frozen carbon dioxide. In this summertime view, the mesa slopes and pit walls are darkened as sunlight causes some of the ice to sublime away. At one time in the past, the crater shown here may have been completely covered with carbon dioxide ice, but, over time, it has been exhumed as the ice sublimes a little bit more each summer. The crater is located near 86.8°S, 111.6°W. Sunlight illuminates this scene from the upper left.